Today is a proud day for me – the day we release Revolutions, my first anthology as editor. 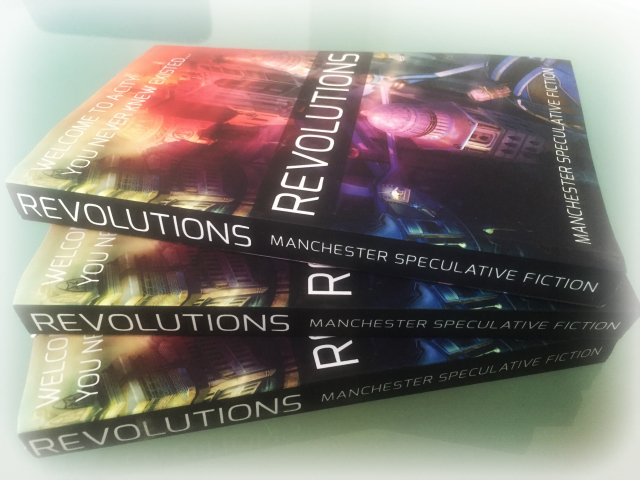 Revolutions is a collection of science-fiction, horror, dystopian and just plain weird short stories with one thing in common – they’re all set in Manchester, England. The anthology is published by Manchester Speculative Fiction Group, but only some of the stories in it are by group members, because we ran an open submissions process and chose the stories on merit. We had over sixty stories submitted, from which we chose the seventeen we liked the most. Manchester is a terrific setting for speculative fiction. It’s a steampunk city for one thing, full of what-ifs from its Victorian golden age. But Manchester also witnessed the birth of the technological era – the atom was first split in Manchester, and the first computer was created here too. At the same time, if you look at it differently, it’s not hard to see a dystopia. Manchester’s astonishing ascent was built on the exploitation of the starving, diseased and down-trodden workers, and Friedrich Engels was so appalled by Manchester that he invented communism. So, Manchester was a great theme to tie disparate stories together into a coherent collection. Comedy: Once Upon A Time in the Northwest’s pie-gladiators, and Gasoline Alley’s Manc-Scouse war are surreal and fun. Future Dystopia: there are no zombies, but down on the streets the future is grim in Sarah Jasmon’s excellent The Uncertainty Principle, eco-dystopias, No. 5 Passage, and Bridgewater, and future-noirs Cold Metropolis and Wrath and Duty. Horror: Die Booth’s brutal Maketh the Man, Eric Steele’s thrilling Earthsong, and the chilling The Attic of Memories all push the right horror buttons. Sci-fi: Craig Pay’s Traveller and Katya Fawl’s Waterways are classic sci-fi ideas with great Manchester twists. General Weirdness: Please, Please Let Me Get What I Want, The Last Drag Show On Earth, When the Sun is Dead, Toil and Trouble, and Until Further Notice all defy classification and show prodigious imagination and storytelling skills. Manchester Speculative Fiction Group was established in 2010 for writers interested in writing science fiction, weird fiction, slipstream, horror and fantasy. Since then it has had many successes: two members of the group have had novels published so far, and others are on the way, having gained deals or agents. Several have won writing competitions and had short stories featured in magazines and anthologies. The cover was designed by me, based on an illustration by Alex Mit. Revolutions is available on Amazon US here and Amazon UK here. in 2019, Manchester Speculative Fiction released a second anthology, following on from Revolutions. See Revolutions 2: More Speculative Short Stories set in Manchester. If you’d like to discuss Revolutions, please email me. Otherwise please feel free to share the news using the buttons below.